A Nomination for a Hero Badge comes about when a course of action runs smack into reality. What seemed like a good idea moments before is less so in its execution. This can be an individual failure, the failure of the organization, poor planning or lack of proper training. Generally, it is not because Mr. Murphy of Murphy’s Law fame decided to put in an appearance. Nominees are limited to public safety agencies and its operatives. It would be unfair to law enforcement, fire and EMS to include politicians because nobody else would ever be nominated. This is an ongoing affair. In this instance we have a Texas police officer responding to barricaded gunman call. The officer is standing by a patrol car and has just retrieved her chopped AR-15 from the trunk of the patrol car (the back deck lid is ajar). Look at the picture any problems? 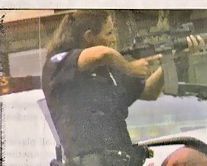 We have no way of knowing, from the photo or accompanying story where the officer is in relation to the gunman. If she is on the outer perimeter then her concern should be to keep people, like photographers out. Whoops. If she is on the inner perimeter then her focus should be to contain the suspect and obtain proper cover and concealment. The trunk of a Crown Vic offers concealment, provided you squat or kneel down. It does a lousy job of offering cover, the ability to stop or slow down a bullet fired at you. But the #1 flaw is the pointed end of the bullets in the magazine, face front. The magazine, the square thing that her right index finger is pointed at, has been inserted into the magazine well backwards. Not only is it backwards but it was inserted with such force that it stayed there. Magazines wrongly inserted have a habit of falling out because they don’t engage the internal mechanics that would cause them to stay. This weapon will not function and may require the services of a gunsmith to bring it back on line. I reject the premise that this is an individual failure, “after all she is just a girl.” The problem starts with procurement. If a police department decides to equip its officers with AR 15’s or M-4’s it also needs to commit to training and the ammunition to support it. My comfort zone is 1000 rounds per officer. Do the math, it is not the cost of the gun but the ammunition, overtime, and maintenance that eat up the budget. Next are standards. TCOLE the police licensing agency for the State of Texas requires that officers demonstrate proficiency, once a year, by firing 30 rounds with a “patrol rifle.” Included in the course of fire is one mandatory magazine change, boy howdy that will build muscle memory. This is the perfect excuse for parsimonious chiefs, “we have met or exceeded state requirements in our training…” Finally, there is the willingness of the line officers to accept inadequate training and not seek alternatives on their own. A picture may tell a story, just not the whole story. Posted in Criminal Justice, Nomination for a Hero Badge and tagged firearms, standards, SWAT, training. Bookmark the permalink.